Time to dive into those violet hues? The built-in metallic shine booster, with coconut oil, leaves hair gorgeously glossy with a cool metallic finish. For healthy-looking, touchably soft hair! But now years after, I find Live color Amethyst Chrome and Im so happy! Please, keep manufacture this forever! This hair dye is cool, it look like little dark inside and in sunshine it is very intensive. Many people praise that it glows in many shades and look like powerful and beautiful. Lovely colour and shine. Easy to aply too. Covers greys well. I'm so disappointed with this hair dye. Used it in my natural medium brown hair and it's came out black. Can't believe it's came out like that. I've cried all day. Response from Schwarzkopf LIVE: Hello Kirstie, we're sorry and concerned to hear of this, and suggest you speak to our Colour Advisory Team, who will be able to help you with this issue. They can be reached on 0800 328 9214 or at consumer.advisory@henkel.com. Thank you. 60-something with reddish brown hair, now greying. Had played around with temporary colours on the grey streaks, decided to go the whole hog. Was really happy with the colour and have had many compliments. However as my hair is long and thick, it took a second application to get full coverage. It does cover greys well. Response from Schwarzkopf LIVE: Hello Sharon, we're sorry to hear of this and can certainly appreciate the frustration caused. If you would like to speak to someone further about this issue, please contact our Colour Advisory Team on 0800 328 9214 or at consumer.advisory@henkel.com. Thank you for taking the time to review. Having used red passion for 6 years I fancied a change. I stripped my hair and used the Amethyst chrome. The colour looks great. It's quite subtle at the moment due to being used on stripped hair and I'm looking forward to seeing how it looks after a couple more uses when the colour builds up. Much darker than suggested, over my mid brown, some bleach through ends of my hair where its taken as dark purple but top looks black. Luckily I'm ok with the subtle look! Response from Schwarzkopf LIVE: Hello Emma, thank you for taking the time to review! Sorry to hear about the increased depth- sometimes if your hair is porous/dry, the hair will grab the colouring, causing an intense result. Furthermore, if applied on top of previous colour, this will also increase the depth. Hope this helps! Response from Schwarzkopf LIVE: Hello Rachel, we're really sorry to hear of this! Applying colour on top of previous colour can cause a build up on your hair, leaving a dark, block result. For best results, use on natural/virgin hair. If you would like to discuss this further, please contact us directly on 0800 328 9214 or at consumer.advisory@henkel.com. Thank you. Response from Schwarzkopf LIVE: Hello Samantha, thank you for your review! Make sure you're using shampoo & conditioner specially formulated for coloured hair, and moisture rich treatments at least once a week- this will ensure the colour holds in your hair :) Hope this helps! Was really looking forward to using this colour, so for maximum effect I lightened my hair before hand to get it as close to the front box as possible. It didn’t turn out the same but was still a beautiful colour, but I’ve washed my hair only twice since I’ve done it and it’s already faded to a browny-purple shade. So disappointed with this one. I never had any fade with the live colour and lift! So I expected the same with this! Response from Schwarzkopf LIVE: Hello Chantelle, thank you for your review. We can assume the quick fade was because you have used this product outside of its shade recommendations, this product is recommended for use on Dark Blonde through to Dark brown natural hair colours, we do not advise pre-lightening prior to use, as this will affect the way this colour is absorbed. I hope this helps for future colouring :). Used on top of raspberry rebel (fantastic colour just wish it was permanent!). I also did half my hair with mercury something basically the blue in the urban metallic range. Colour started off dark, but I didn’t mind that assumed it was the pink issue. Washed a few times and it was beautiful! Now both have washed out loads to a sort of grey lilac and grey blue. This isn’t a great look. This is in the space of 3 weeks. I thought I was doing something wrong till I spoke to a friend and exactly the same thing happened with her and the blue colour. I shall try one of your other purples to cover it up as I’ve never had this before I can only assume it’s due to the metallic part of the hair dye. All in all I’m not impressed. Have always raved about and swore by the live range, here’s hoping another one of the purples covers it and I don’t have to go too dark. Response from Schwarzkopf LIVE: Hey Charlene, we're sorry to hear of your disappointment. We're assuming that before the Raspberry Rebel you were a light blonde or had bleached hair- which unfortunately the Amethyst Chrome and Blue Mercury cannot hold on to, as they are designed to be used on deeper natural hair colours. Please be assured that the Urban Metallics range is just their name, none of our colourants contain Metallic Salts. If you would like any further help or advice with this, don't hesitate to contact our Colour Advisory Team on 0800 328 9214 or at consumer.advisory@henkel.com. They will be happy to help :) Thank you for taking the time to review! Response from Schwarzkopf LIVE: Hi Jo! Thank you so much for your kind and lovely review :) Very happy to hear you love the Amethyst Chrome! I used this U69 Amethyst Chrome and my hair got super dark... I want a vivid pink/purple colour so this was really dark :( Is it because I already had a pink colour from before? Or if I had it in too long? Had it in for 30 minutes like the package says. Response from Schwarzkopf LIVE: Hi there! It is possible that the previous colour on your hair has caused the Amethyst Chrome to go slightly darker than designed- as colour on top of colour will build up, intensifying the result. Hope this helps! Great colour would been great if I used it on natural hair colour but used it on top of pure purple but came out a great colour it will look great when the sun comes out so couldn't get a great picture but will post one these colours are amazing. Response from Schwarzkopf LIVE: Thanks so much for taking the time to review Alison! This colour went nothing like it shows on the box, I love this brand and some of its other purple shades I love but this amethyst colour is awful it's really knocked my confidence! Response from Schwarzkopf LIVE: Hi Lucy, we're very sorry to hear that you didn't get the results you were expecting. We'd really like to talk to you about this in more detail, so if you'd like to, please call our Schwarzkopf Advisory team on 0800 328 9214 and an advisor will be happy to help. Thank you. So, I tried dying my hair violet with another brand's product. After lightening and de-colouring my hair, it came out looking like a unicorn had an accident on my head. 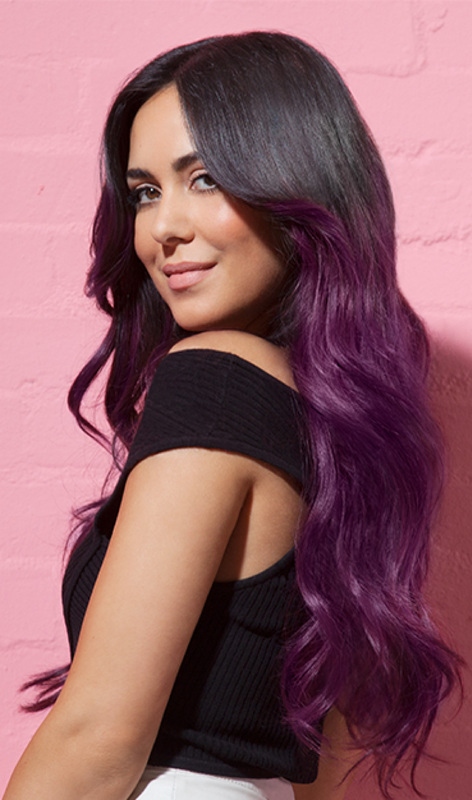 This product saved my hair and it is now the perfect shade of purple-violet. Thank you! Response from Schwarzkopf LIVE: You're welcome Noora :) Thanks for leaving your review! I loved this colour I put it on as a top up over the ultra violet dye and it took amazing. Stayed Bright and shiny for a lot longer than any others. Would defiantly recommend this one if your looking for something a little bit brighter than the other purples! Also leaves your hair feeling and looking amazingly soft for a long time! Response from Schwarzkopf LIVE: Great review, thanks Sophie! This colour is awesome. Covers all grey and looks different colours in different lights. Will be sticking with this one for a while. Before this I had Live Pure Purple. Response from Schwarzkopf LIVE: Lovely to hear that Janie, thanks for leaving your review!